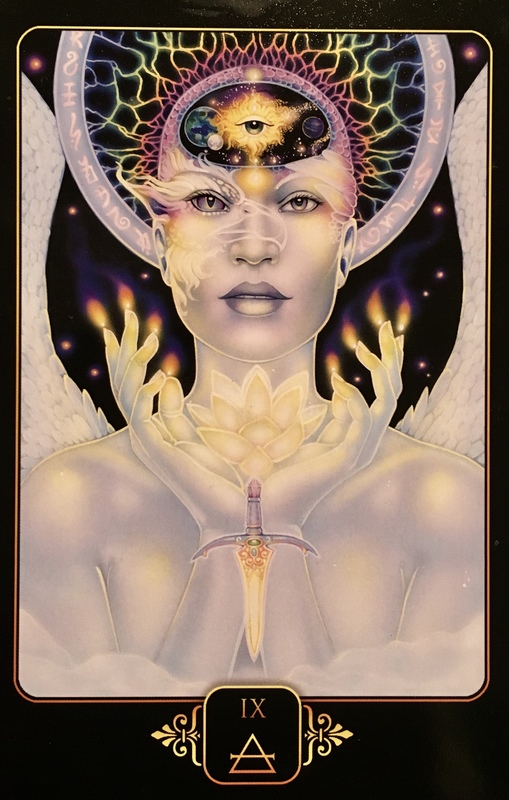 Card Meaning: “The Nine Of Air represents the imagination and our connection to the Universal Consciousness or Universal Mind. It signifies the importance of knowing thyself, for in truly knowing thyself one will know both the universe and the power of the Void. Ask yourself, what if the universe we dwell within is actually the mind of another being? What if the universe is, in reality, a God Mind, and we the creation of another being’s imagination? What if, within our minds, there exist universes within universes, where creatures that we dream of and imagine dwell in the same way we do here upon the earth, and within their minds are more universes? Like fractals, where the same pattern repeats and creates, our minds contain a universe, and within that universe are creatures and beings, who also have universes within their minds. The universe in which we dwell is one of billions existing within the mind that is yet another universe. The pattern repeats in both directions exponentially, creating an infinite number of universes and realities. Now ponder a moment… what if we looked within, and discovered that within the realms of our minds, we create new worlds and realities within our belief? We choose to believe in something, and a new world that mirrors that belief is born. We stop believing in something, and that world either evolves with our beliefs or ceases to be, completely. Universes overlap, are born and die, forever bound to the life and beliefs of the God Mind that created them. What if billions of lives were dependent upon our belief for their very existence? Would it not be wise to believe with understanding and knowledge? Would that not create a universe that is a little more constant and conducive to life? What if we are the only beings within this universe because the God Mind in which we dwell is a young mind with limited exposure, and, at this time, only believes in our existence? Simply put, he believed that to know oneself, was to know the universe, and the power of the gods, and he is correct. Everything man has within our physical reality, that is not born of the natural world, was first imagined by man. The television, the phone in your hand, the laptop on your desk, the movies you watch, the car you drive… everything that man has created… was first imagined by their inventor. Moreover, when those brave souls voiced their desire to create their new and strange contraptions, they were seen as crazy, eccentric, and foolish. They were told that what they wanted to create was fantasy. At one time or another, everything we have in our present reality, was once deemed to be an impossible fantasy, and yet now, these things exist, and we take their existence for granted. This is the power of the mind, and the mind’s true potential has not yet even begun to be understood, or known. All we do know is that the only limit to the mind and what it can do is one that we, the individual, place upon it. We are only limited by our imagination… or lack of it. By looking within, learning and understanding the mind and the complex manner in which it controls our lives, and how it has taken our life experiences, and used them to influence all we do and all that we are, we can choose to unlearn some beliefs, change our thinking, and embrace a new, less restrictive way of thinking. You can become the God mind that you are – and within your mind, you can imagine, and make what you imagine into a reality. We live in a society that admires innovation and creativity, and yet, paradoxically, fears it, and at times actively seeks to destroy the desire to create. We may be exposed to teachers who punish those who ask questions and challenge the answers because they know there is a better way. We might be ridiculed by family and friends when we use our imaginations, and speak of things that are deemed to be fantastical and unbelieveable, but again, all that exists in our present reality was once fantasy and dwelt only in the mind. We may find we are repeatedly trained to reject creative endeavors as a waste of time and effort. The Nine Of Air represents the importance of knowing your mind, understanding the beliefs and thoughts that limit and restrict you, and freeing your imagination. Now it is time to embrace innovation and creation. It is time to step into the realms of the unknown and imagined, to enter the Void – where your imagination is most powerful – and bring what you find there to life. You are born of a Universal Consciousness. You are capable of greatness, but all too often you may have been punished for seeking it. Nonetheless, it is time to let go of any unconscious bias against creativity, and embrace it as the expression of human power and ingenuity that it is. Potential Blockage: “All too often, we allow fears, sometimes imagined fears, to prevent us from leading a happy, productive, and fulfilling life. We limit our potential because we imagine we will be laughed at. We do not express our thoughts and feelings, because we fear what others will do, or think of us, if we are honest. We imagine failure, and so we may simply not try. The Nine of Air represents the opportunity to use of our imagination to banish our imagined fears. You may have a fear of heights – even if you have not fallen in reality – because you have imagined falling. Or you may choose not to take an opportunity and try, because you have imagined failure. Likewise, you may reject a potential relationship, because you imagine it not working. Today is the full moon in Leo and total lunar eclipse. There is a whole lot of intense energy to be felt, which if you are sensitive, probably started a few days ago, or even at the new moon on the 6th. You may find yourself or the people around you to be more emotional, anxious and even possibly confrontational. Remember this too shall pass and do not get sucked into the vortex of drama. Instead, batten down the hatches and use this energy to purge your own fears and doubts, then get really clear on your intentions. Give a wider berth to those who already tend to be on the easily triggered side. This is a great time to retreat; get away by yourself even if it just means an extra yoga class or walk in the woods. Keep your own energy balanced and remember how important it is to take responsibility only for yourself and your own reactions, not the actions of others. Release the need to control and steer clear of those who would control you. Use this opportunity to channel your positive energy, raise your vibrational frequency and set your intentions for this upcoming lunar cycle, you will be amazed just how powerful this energy can be to work with if you make the most of it, rather than getting caught up in it. Think riding the wave surfer style rather than getting caught in the undertow, it is always up to us! What do you wish to create, and what are your the frequency of your thoughts, feelings and actions towards making that happen?